I want to start out by saying a huge thank you to all the dishwashers that have ever been in my life. I miss you and appreciate all the dishes you’ve cleaned for me. No, seriously. I miss having a dishwasher and I’m oh so thankful for them. I wandered in to the kitchen today (this doesn’t take much, our tiny abode is, well, tiny) knowing that I had to do SOME of the dishes in the sink, today and no more ‘eventually’ about it. When we moved from WA state we not only left behind our cute, cozy, but newer home, a lot of rain and some greenery; we left behind our own washer & dryer, and the dishwasher. Some days this bothers me far less than others. Ok, most days it bothers me far less than others, but mostly because I just don’t do it that day and we end up waiting one more day. And though I know to some people this would seem like one of those complaints about “1st world problems”, and perhaps it is in a way; however when just getting out of bed can be tiring, when sitting, walking, running, standing, and often all forms of laying down even are painful (and feel exhausting) – the idea of spending half an hour or more scrubbing dishes is less than ideal. But this would be day 5 of not cleaning the dishes, and I’ve run out of any clean dishes so I can’t eek by any longer. This is a point at which the mental and physical fatigue I feel just have to be ignored. It isn’t to say that it no longer exists, but that at this moment, it is less important than clean dishes – if not for me, for the rest of the house. 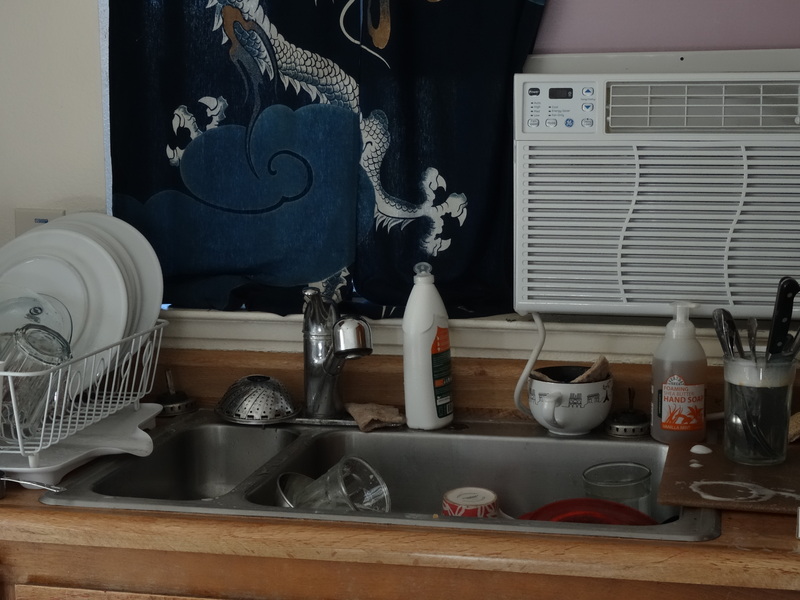 I think that part of this block to clean the dishes stems from such a small space to do much of anything in the kitchen, cleaning, cooking, breathing (although the draft from the edges around the AC unit there help!) and I find myself standing there missing what was so much more than I .. well, than I want to. I’m very thankful to have a fairly functioning kitchen, however I deeply miss have a kitchen more than 10 sq. ft. (including counter space and cupboards), and I long for a bit more space to stretch out in to, to cook, to bake, hey! Even.. to clean the dishes. 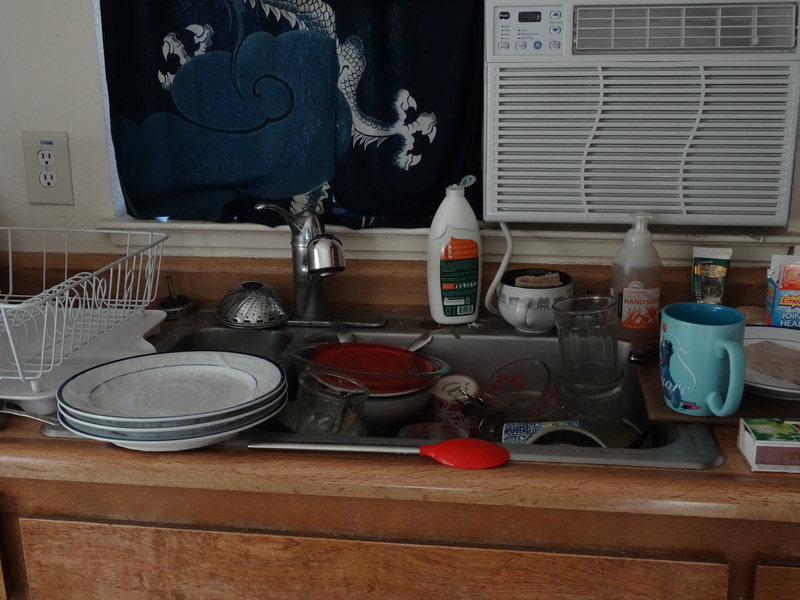 I’ve considered adding a second dish rack on the right side of the sink so that I can get all of the dishes at once, but there’s no where really to store it when I’m not using it so… that idea goes right out the proverbial window. I suppose that really it will come down to doing every other day what I normally only dig up every few days, the desire for a clean sink overpowering the pain and fatigue. And thankfully I have a spouse that has finally come to a point where they are ok with such housecleaning disasters – even suggesting that I get some outside help in to clean up this week. And I’m thankful that for one of the first times in my life I felt ok with this idea (there was a part of me that wasn’t but it was finally a small part), I felt OK asking for help and admitting I couldn’t really do it all without destroying my precariously balanced state of health. I could finally, fully, admit that scrubbing the kitchen & bathroom floors, the toilet, the counters, the stove and then perhaps vacuuming would indeed be too much to take on (as it has been for many years) without too much guilt. Guilt is such close companion to fibromyalgia, chronic fatigue, and all manner of illness – that voice that says what I “should” be able to do, what I wish I was able to do, and how much better I might be if I did it and ignored the end results. Which are usually pain, fatigue, bitchiness, sorrow, depression, and lots of sleeping. Somehow those things don’t pop up quite as strongly as guilt does though. However, thankfully, gratefully, the past couple of years I’ve been slowly releasing the guilt and letting in the sunshine. Someone else out there is willing to do these things for me, and I’m ok letting them, mostly. Of course… in our next place? Dishwasher, Washer & Dryer, my friends how I’ve missed thee.